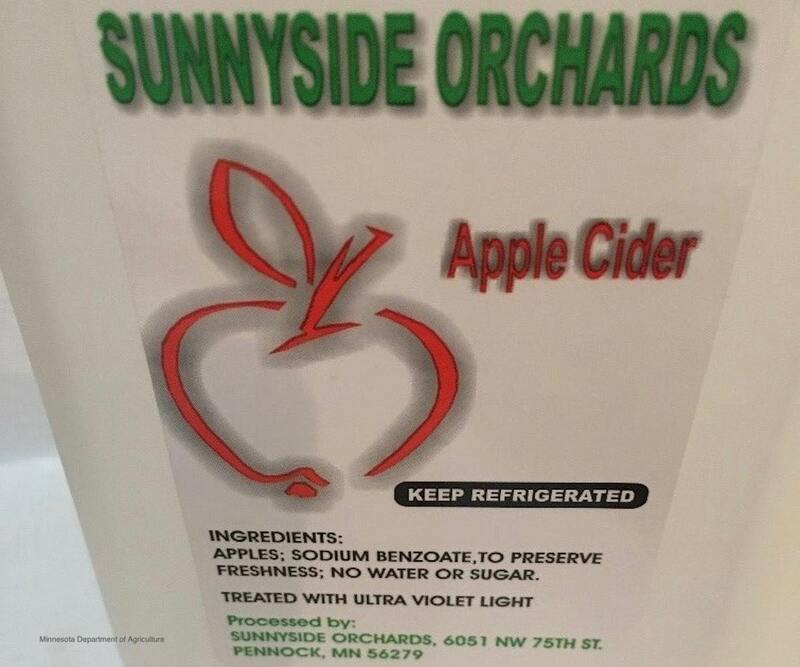 Sunnyside Orchards apple cider is being recalled, and the Minnesota Department of Agriculture is issuing a consumer advisory because that product was apparently inadequately processed and stored at improper temperatures, which would allow the growth of potentially harmful bacteria. All cider produced since August 31, 2018 is affected by this recall and advisory. The cider was sold in gallon and half gallon containers. No reports of illness have been received to date in connection with this recall. The notice did not state which pathogens may be a risk for this type of product, but officials did say that if you have experienced vomiting or diarrhea after drinking it, to see your doctor. Officials do know of some locations that have sold this product, but this list is not complete. The cider may have been further distributed by other facilities. The locations that have sold this product include Community Basics in Willmar, MN; Cornerstone Coffee in Willmar, MN; Dassel Hillside Farm in Dassel, MN; The Fortress in Willmar, MN; The Goodness Coffee House in Willmar, MN; LuLu Beans Coffee Shop in Willmar, MN; Stacy’s Nursery in Willmar, MN; and Youth for Christ in Willmar, MN. If you bought this cider, don’t drink it, even if you are going to cook with it or heat it first. Some bacteria can produce toxins that survive cooking temperatures that can still make you sick. Throw the cider away after first wrapping it in plastic wrap or foil, or take it back to the store where you purchased it for a full refund. Wash your hands well with soap and water after handling this product.